In 1979, after returning from a spell in the early Dubai building boom, Loraine Wilson swapped life as an Architectural assistant for trek leading, mainly in the mountains of Greece. 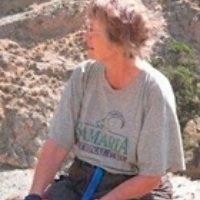 A lifelong hill walker and backpacker, she has been walking the Cretan mountains since 1983. In 1995 a course in Heritage Management alerted her in a more formal way to the necessity of encouraging 'inland tourism' in Crete and places like it. It was in the hope of making a useful contribution that this book was written. Formerly London-based, Loraine now lives in Cumbria.